Over 50 public interest non governmental organisations (NGOs), civil society organisations and social movements have sent an open letter to WHO’s Executive Board members – who are meeting this week in WHO’s HQ in Geneva. The NGOs call for an end to the tortured process of the development of a proposed “Framework for Engagement with Non State Actors” (FENSA) that from the start, 4 years ago, has been set on the wrong track and poorly informed. 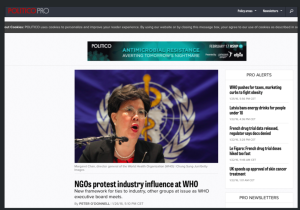 These NGOs believe that FENSA legitimises old channels of corporate influence on the WHO. Even worse it opens WHO up to new undue influences by the corporate and venture philanthropic sector and threatens the organisations integrity, independence, and credibility, thus its ability to fulfill its constitutional mandate. FENSA fails to recognise the different nature and interests of transnational corporations, their business associations and venture philanthropies compared to public interest groups. Symbolic of this failure is one of the principles that FENSA is based on: ‘inclusiveness.’ This term is much favoured by businesses and their front groups – because it opens the door to undue influence in the setting of public health policies and priorities. The FENSA negotiators failed to recognise that this principle contradicts the basis of all effective Conflicts of Interest (COI) policies which must consider which actor to exclude, when and why. A strong COI policy uses vigilance and arms length approach. Such a policy would not preclude – as apologists of the FENSA draft falsely argue – interactions between WHO and corporate actors when necessary, but it would ensure these are appropriate. Based on these and other concerns, NGOs ask the MSs to stop drafting the details of FENSA and instead take a clear political decision on whether WHO should stick to its mandate to work for people or that it should now increasingly serve private sector interests. The corporate sector is the main culprit in one of the biggest challenges WHO is facing in chronic diseases, with bad diet now the largest cause of death and disability. NGOs hope that Member States recognise the harm that a decision that would lead to an increase in private sector power in WHO would have for the future of global health. IBFAN – the International Baby Food Action Network – consists of over 27o public interest groups working in 168 countries to promote the health and well-being of infants, young children and their mothers through the protection, promotion and support of optimal infant and young child feeding practices. IBFAN works to eliminate the irresponsible marketing of breastmilk substitutes and feeding bottles through full and universal implementation of the International Code of Marketing of Breastmilk Substitutes and subsequent, relevant World Health Assembly Resolutions.